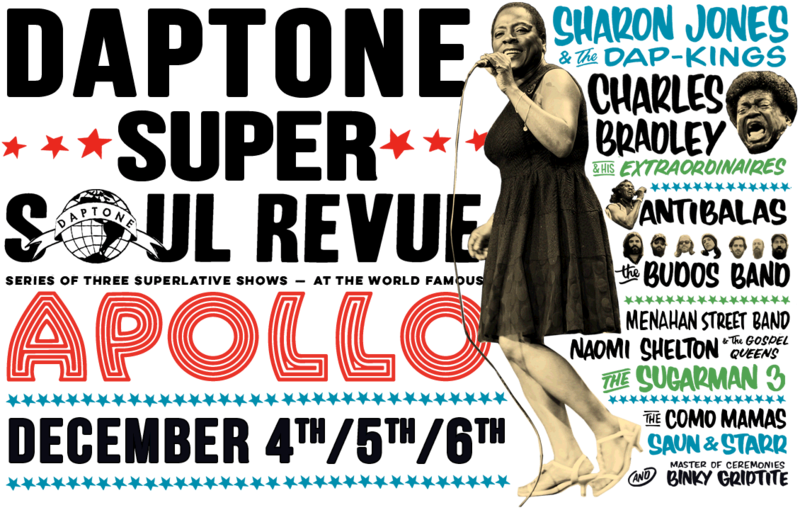 The Brooklyn record label Daptone are bringing their Super Soul Revue to the Apollo in Harlem for three nights. This includes Sharon Jones & the Dap-Kings, Charles Bradley & His Extraordinaires, and Naomi Shelton & the Gospel Queens. The events are recorded for a forthcoming live album, following the tradition from James Brown and his legendary “Live at the Apollo”, recorded in 1962 (one of many live albums Brown recorded at the venue). We were there last night, for the premiere. Besides the aforementioned artists, The Sugarman 3, Saul and Starr, and Antibalas performed. An early highlight of the evening was the brief performance by Naomi Shelton. Although troubled in her movements, the 70 plus singer gave a heartfelt version of Sam Cooke’s “A Change is Gonna Come”, as well as a rousing “What Have You Done, My Brother” (see the great video, recorded outside the Daptones recording studio in Bushwick, below). Coming up from the subway in Harlem, you could hear helicopters hovering. Yesterday was just about a week after the Ferguson verdict had been announced, and even more strikingly, just the day after a grand jury in New York had decided not to indict a white New York City police officer for choking the black man Eric Garner to death. 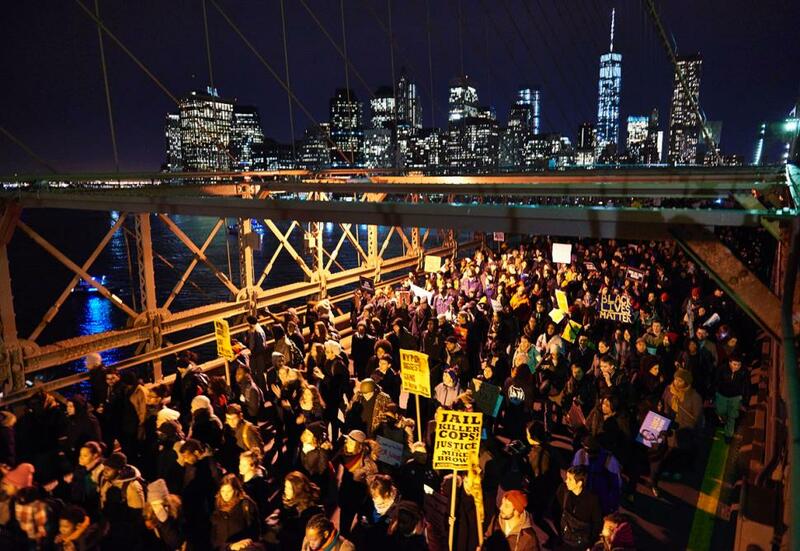 All over the city, as well as in other cities in the country, demonstrations were being held. 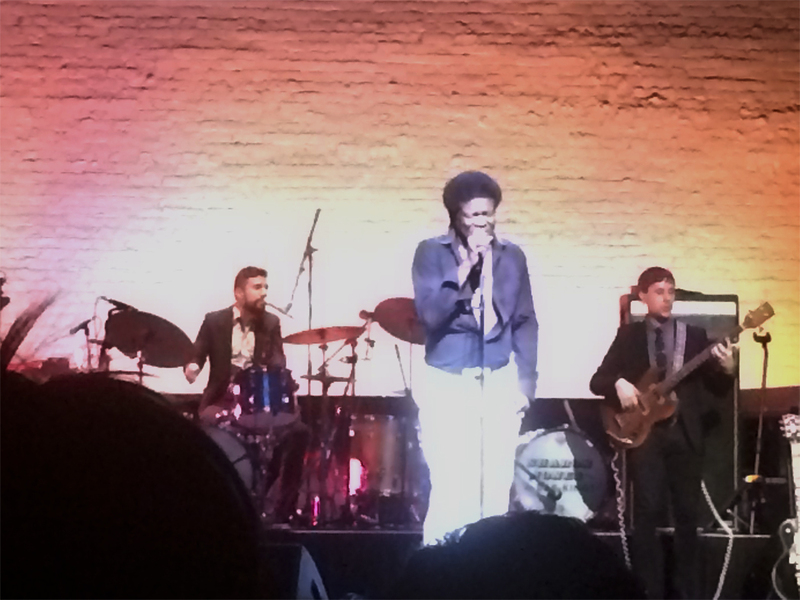 In the end, however, the evening belonged to the label’s greatest star: Sharon Jones. After finishing her latest album last year, she was diagnosed with bile duct cancer, and had to have very serious surgery and chemo treatment. An extremely tough time (read the wonderful interview with her in Rolling Stone, where she not only discusses her time with cancer, but also how she as corrections officer at infamous New York City jail Riker’s Island had to sing Whitney Houston’s “The Greatest Love” to get the inmates to go to their cells). But now she is back. She made the Apollo into her church, singing and preaching her gospel.The short clip below can only hint at what her performance was like. But see it as a teaser, awaiting the album and dvd to come.